How lovely, the silence of growing things. If you follow me over on Instagram, you've probably noticed that I have turned in to a bit of a crazy plant lady. Up until about six months ago, I couldn't keep a plant alive if my life depended on it. No joke. Cactus, succulents, bamboo... I swear they'd take one look at me and just shrivel up and die. Shortly after I bought the house, I ventured out to Ashcombe Farms (if you're local, go check it out. I absolutely love them.) looking for a Christmas wreath. Wandering through their greenhouse, I noticed they had the cutest little succulents and decided to go for it. And wouldn't you know... the little guy thrived. With a little luck, some help from Google, and my new favourite blog: Leaf and Clay I've been learning like crazy and filling my house with lots of air cleaning greenery. One of the coolest things about succulents is how easy they are to propagate. Seriously, if I can do it, you certainly can. There is something so exciting about taking one plant and making a million more (it's starting to become a problem...). I am by no means an expert, but I thought I'd share something a little different for once. Succulents will grow tall searching for the sun (kind of like this guy is starting to do). The leaves will start to get too spaced out along the stem, making it the perfect time to propagate! First, you want to remove all of the bottom leaves. Hold the leaf near the steam and gently wiggle back and forth. When it breaks free, make sure there's a "clean cut." If it looks like there's a little bit of skin holding on, gently remove that, or your leaf won't root. 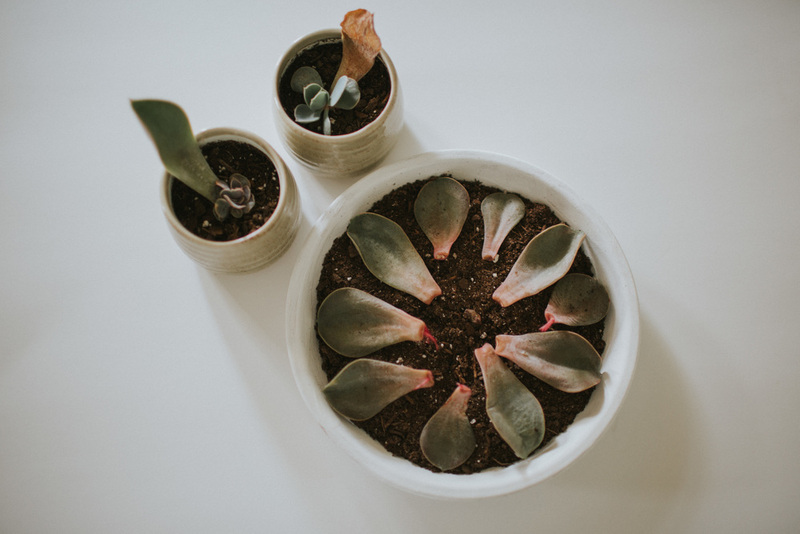 Once you have the big spaced out leaves removed from the stem, you will want to place them in on a window ledge (I sit mine on a paper towel) that gets good indirect light. Leave them there for a couple of days to allow the "wounds" on the leaves to "heal." You will see them dry out and almost scab over. 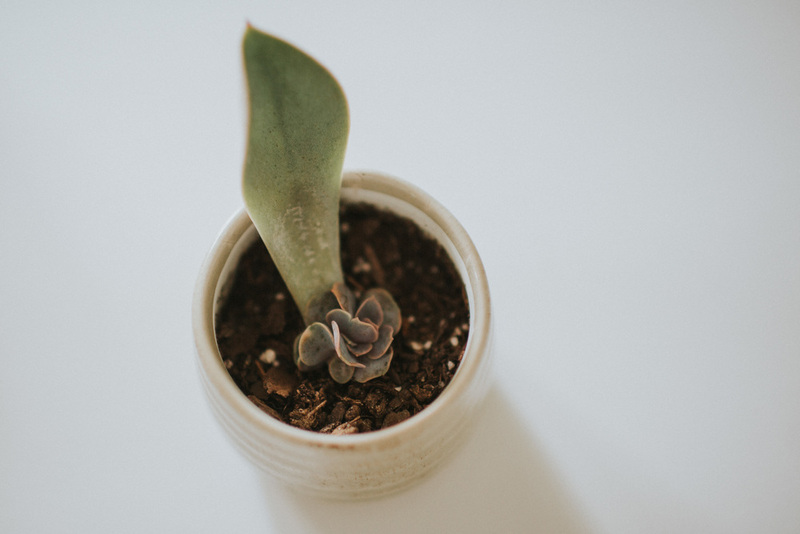 After your leaves have healed, grab a container, lid, or pot saucer, and fill it with good succulent dirt. Spread your leaves out over the dirt and water sparingly. I leave them on the same window sill and mist them with a spray bottle once every day or two. 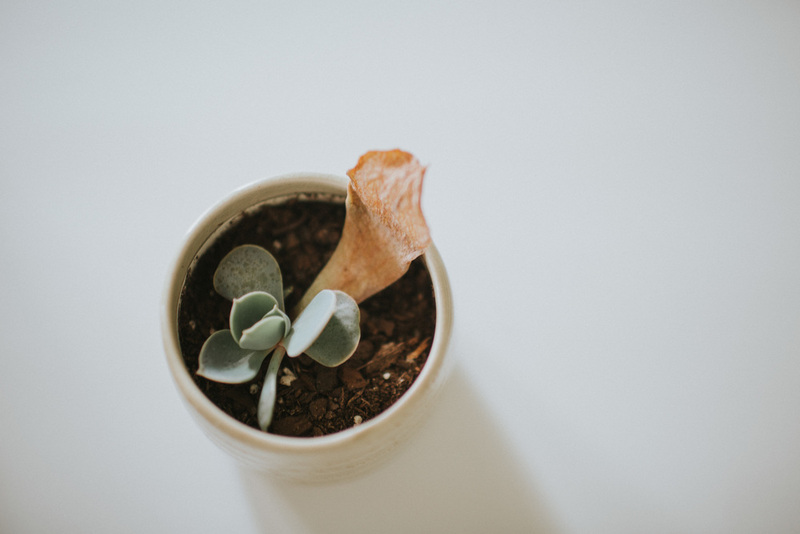 Eventually, the new succulent will use up all of the old leaf's energy and it will fall off. The two plants in the photo above were propagated at the same time- one leaf is still going strong and the other one is just about done. You can plant your leaves when the roots sprout, or wait until the leaves have fallen off.